Jars of baby food are a great source of food for your baby. Please don't feel guilty about not making your own baby food. Caregivers, especially mothers, have enough guilt to go around. When choosing baby food in jars, the only choices are between organic and conventional. Baby food is highly regulated and tested routinely for amounts of chemicals, so there is probably no reason to be too concerned with conventional baby food. On the other hand, organic baby food is grown without using pesticides so you can be sure that it will be pesticide free. There is no study testing conventional baby food versus organic baby food for number of chemicals in the food so the choice is really yours. In addition, there is no data that links increased amounts of pesticides with illness in children or adults. But, this is a very hard study to do and we all know that farm workers that get exposed to large amounts of these pesticides get sick. In some supermarkets, most likely an upscale grocery store such as Whole Foods, you can find fresh made baby food in the refrigerated case. They are just like the baby food in jars, but they are made fresh and have a short expiry date. They are much more expensive than baby food in jars or making it yourself, but you can't beat the convenience. Farmer's Markets and CSA (Community Supported Agriculture) provide a way to buy directly from farmers in your area. The disadvantage to Farmer's Markets is that you must travel to them, and the produce can cost more than the supermarket. Some farms do provide a service where they deliver a box of produce to your door (a happy thing for busy parents). The advantage of a "direct from farm" produce source is that you get what is in season and hopefully you get really fresh produce. This can be a life altering event. For example, you may hate strawberries because they taste like styrofoam with red paint on them. A farmer's market strawberry may have been picked the day before and may be a different variety than in supermarkets. They might be soft, flavorful, and luscious. You may change your view on many fruits and vegetables after you taste the "farm fresh" variety. Finally, farm produce can be variable just like stores. Some farms have better produce than others, so don't get discouraged if you buy mealy apples or wormy cabbage. Talk to the farmers, remember the good ones, and go back. 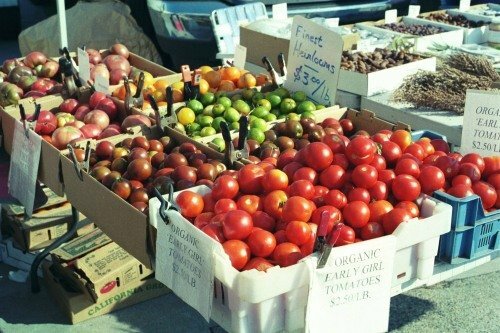 What exactly are you looking for from a farmer at your local farmer's market? Here is a list of some features that will make a significant difference in the taste of your produce and will have you asking for more! The farm picks the fruit as ripe as possible, and get it to their customers as soon as they can. This is quite risky, because the riper a fruit the softer it is, thus it is more susceptible to damage and spoiling. They don't pump their plants with too much fertilizer, which would give them tons more fruit, but much less flavor in each one. Organic methods help in this regard because our organic fertilizers release nutrients to the plant slowly. They choose varieties that taste good. Unfortunately, those varieties invariably produce lower yields (and hence higher per-unit cost). They build their soil. Rich soil offers the plant a wide range of nutrients resulting in a more complex flavor. They don't water too much. The extra water dilutes the flavor. Organic produce is grown without pesticides or petroleum based fertilizer. Organic fish, beef, or pork products have been fed on organic feed. Crackers, cookies, and other processed food that say organic have been made with organic wheat, sugar, etc. For a baby, the amount of food that is ingested compared to body weight can be quite large since they are growing at such a rapid rate. Organic food ensures that there is a reduced amount of pesticide residue in the food that you are serving. The USDA has analyzed the pesticide residue in our produce, and has concluded it is safe. But, as new parents, being extra safe with our babies food can keep the anxiety down. We know that farm workers that are exposed to pesticides have health problems, therefore these chemicals are not entirely safe for humans. The question is what concentration of the pesticides is harmful for our children. That question has really not been answered since the studies would be very difficult to do. Here is a list of the "dirty Dozen" of fruits and vegetables that you should buy organic when you have the choice. No amount of washing can rid these fruits and vegetables from the pesticide that has already been incorporated in its cells. This list is based on an analysis of nearly 51,000 tests for pesticides on these foods, conducted from 2000 and 2005 by the U.S. Department of Agriculture and the Food and Drug Administration. This information is included in your weekly e-mails for each suggested food for your baby to try. In most supermarkets you can find both organic and regular produce. Most of the organic produce is grown by "big" organic producers, not small family farms. When shopping for you and your baby, check the organic section first to see what is there. Sometimes you will find that the prices are very comparable to the regular produce and so your decision is easy. It is helpful to have cans or jars of produce in your cupboard for those times that you run out of fresh produce. Some examples are canned pineapple or jarred apple sauce. The good news is that there are plenty of products that don't contain added sugar or salt for you to purchase. You must be extra vigilant because sometimes "sugar free" can mean that the manufacturer added artificial sweetener. You do not want to give artificial sweetener to your baby. Many fruits and vegetables have excellent frozen options. Freezing doesn't change the nutrient content, and is an excellent way to ensure you have some fruits and vegetables on hand when you run out of fresh.